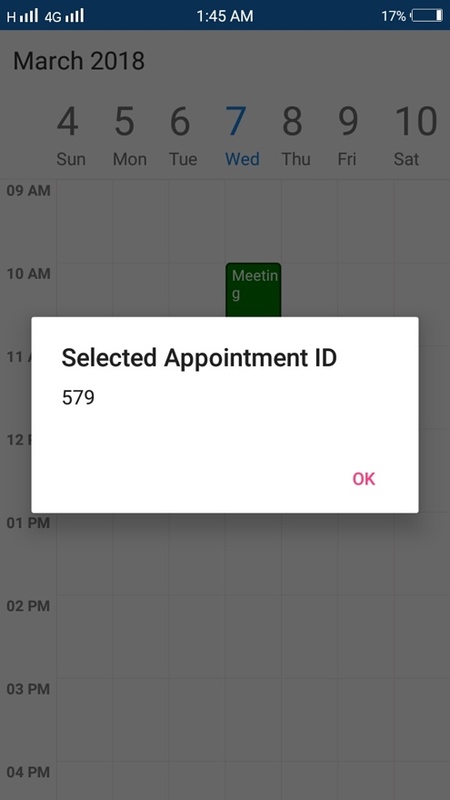 How to add additional attributes for your appointments ? In SfSchedule, you can add additional attributes for your appointments. You need to create a separate class which inherits from ScheduleAppointment and include required properties in this class for adding additional attribute to appointment. In this section, additional attribute (Appointment ID) is added to an appointment. In the CellTapped event of Schedule, you can get the appointment information along with additional attribute included in the argument of the event. You can download the complete project from here ScheduleSample. The following screenshot displays the output of the mentioned project. What is the definition of m_source and shouldn't the custom appointment go to the AppointmentCollection? I've been trying to pass a custom appointment to the schedule, my class definition is basically the same as the example except my field is just id instead of appointment_id. Not sure if I am missing something here or am I doing something wrong? It seems I had some of my references incorrect / loading old versions and new version of different dlls, which I think was causing weird issues.